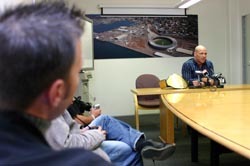 It was at the press conference in Westpac Stadium, right before the WWE SmackDown show in Wellington this past weekend that Kurt Angle spoke of his dedication to the business to a handful of New Zealand reporters, NZPWI Editor Dion McCracken and NZPWI Contributor Troy Rawhiti-Forbes among them. In New Zealand for the first time, Angle expressed his delight in the enthusiasm displayed by Kiwi fans, and the show hadn’t even begun at that stage. Angle and his fellow WWE Superstars were greeted at Wellington Airport with a welcoming powhiri, something they had hitherto never experienced. “It was so overwhelming,” Angle remarked. New Zealand fans rewarded the stars of SmackDown on Saturday night with an off-the-charts response, generating an amazing atmosphere that the wrestlers clearly revelled in. “Coming here, and being able to wrestle in that 30,000 seat arena, for the first time here that’s pretty damn good. It’s not quite sold out, but it’s close. We’re very happy, and looking for a long term relationship,” Angle said. Angle’s low opinion of professional wrestling would change when he accepted the offer from WWE Chairman and Owner Vince McMahon. He spoke of the hard work, dedication and athleticism that it takes to make it to the top of the heap in WWE. 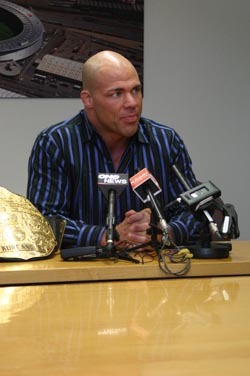 Citing fellow stars such as Rey Mysterio and The Undertaker, Angle describes the talent required to perform in a sport where outcomes are fixed, but the wrestling is real. “I see a lot of athletes in WWE who are just as athletic as I am, and I was an Olympic gold medalist,” Angle says. 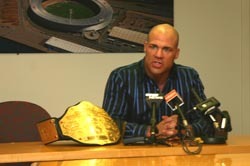 World Heavyweight Champion Kurt Angle at the press conference in Wellington. Angle went on to explain the importance of ring psychology, and the ability to tell a story inside the ring, of being able to gauge audiences and play off crowd reactions. “What you need to do is go to independent leagues and find somebody that will teach you the basics of professional wrestling. And once you get those basics down, and you learn how to tell a story in the match… when you’re out there entertaining the fans, you’re not just doing high-flying spots, and doing things to impress them… some of these guys here do. “But the real meaning of professional wrestling is to go out there and tell a story. When I’m wrestling Undertaker, I’m wrestling a very big man. It’s the big man against the little man. How is the big man going to beat the little man? By overpowering him. How is the little man going to beat the big man? He’s going to chop him down until he gets him down to his size, and basically work the lower half of his body and try to take away his strength. Psychology has a lot to do with it. So, going to these independent leagues and learning basic wrestling, learning psychology, that’s what Mr McMahon’s looking for. And that’s what a lot of professional leagues, like in Japan, United States of America, the very big companies, are looking for. Angle yells at The Undertaker to ‘tap’ in Wellington, Saturday. And it’s also clear that Angle plans to make the most of the time he has left at the top. Though plagued with neck injuries, including another vertebrae fracture sustained immediately after winning the World Heavyweight Championship, Angle insists that he’s smart enough to know just what risks he can take, exactly how much stress his body can take. He will take no unnecessary risks with his health now, in order to continue performing as long as he can, not just for his legions of fans, but for himself. Kurt Angle went on to successfully defend his World Heavyweight Championship that night in Wellington.